Why does Pia Wurtzbach’s wax figure hold a different crown? The former Miss Universe explains why. Pia Wurtzbach's wax figure by Madame Tussauds was finally unveiled for the first time on Thursday, March 28. The former Miss Universe is on cloud nine after finally seeing her replica. "[It] feels like I’m reliving my crowning moment back in 2015! It’s surreal to see my wax figure in the flesh...and I’m really really honored to be the first Filipino to be part of Madame Tussauds!," she wrote on Instagram. 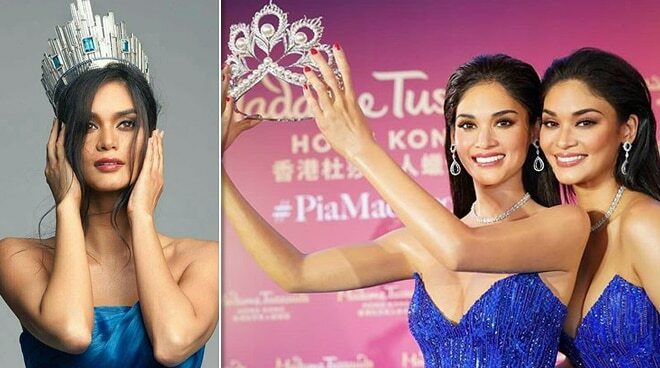 While many netizens were in awe of the wax figure, one netizen was curious as to why the wax figure is holding the Mikimoto crown and not the crown that Pia wore when she won the Miss Universe title. "Why is the crown not the one you wore?," the netizen asked. 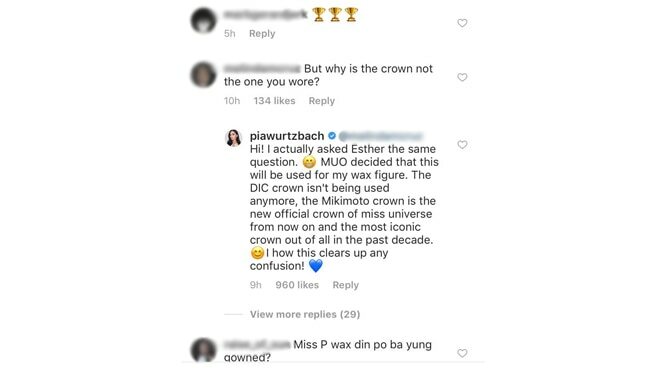 Pia replied, "I actually asked Esther the same question. MUO (Miss Universe Organization) decided that this will be used for my wax figure. The DIC crown isn't being used anymore, the Mikimoto crown is the new official crown of Miss Universe from now on and the most iconic crown out of all in the past decade. I [hope] this clears up any confusion."